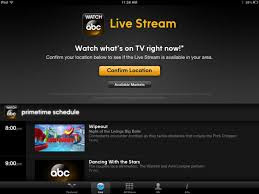 ABC the premier television content provider of United States is launching the long rumoured Watch ABC App for live streaming the TV shows. It is understood that the viewers in New York and Philadelphia will be the first ones to have access to the service via WABC and WPVI channels in those cities. They can watch the live network, local TV shows and other on-demand content. For testing purpose, ABC has made the 'open-access' preview to all users till 30th June. And after that only authenticated customers will be allowed to use the App. At present as per news reports the App will work only on Apple iOS and Kindle Fire platforms. However the Samsung Galaxy will also have this App by summer. In the meantime ABC will also expand into ABC's other owned stations in Los Angeles, Chicago, San Francisco, Houston, Raleigh-Durham and Fresno and separately through a agreement to the Boston, Pittsburgh, Kansas City and Milwaukee views. iOS users in United States can download the App here from Apple Store. Do check out if the streaming has been launched in your area.